John William Waterhouse (1849–1917), Flora and the Zephyrs (1898), oil on canvas, 114.3 × 73.6 cm, Private collection. Wikimedia Commons. In the previous article, I looked at how Botticelli’s Primavera influenced artists in the first couple of centuries after its creation, and how Poussin told a set of stories from Ovid’s Metamorphoses in his sequel Empire of Flora. Giovanni Battista Tiepolo (1696–1770), The Empire of Flora (c 1743), oil on canvas, 71.8 x 88.9 cm, Fine Arts Museums of San Francisco, San Francisco, CA. Wikimedia Commons. In the mid 1740s, Tiepolo painted two accounts of Flora, the first probably being The Empire of Flora from about 1743. She is here seated in a chariot being drawn by winged cupids or winds, brazenly showing off her naked body like a down-market version of Venus. There seem to be precious few references to classical accounts, or those of Botticelli and Poussin. 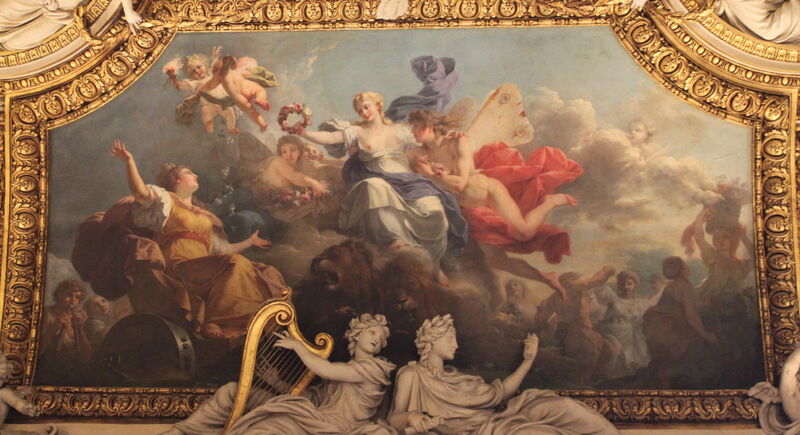 Giovanni Battista Tiepolo (1696–1770), The Triumph of Zephyr and Flora (1734-35), oil on canvas, dimensions not known, Ca’ Rezzonico, Venice, Italy. Wikimedia Commons. 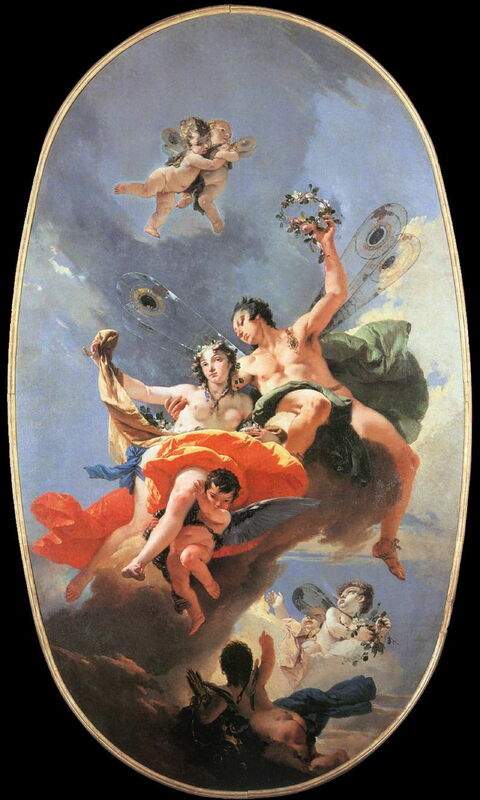 Tiepolo’s second painting, of The Triumph of Zephyr and Flora from 1734-35 refers to Ovid’s account, thus Botticelli’s Primavera, with Zephyrus in flight with his arm round Flora, just about to crown her with a garland. Splendid though these two paintings are, the rich mythical narrative has fallen by the wayside in preference for fleshly romance. Antoine-François Callet (1741–1823), Spring (c 1781), oil on canvas, 53.5 x 96.5 cm, Galerie d’Apollon, Musée du Louvre, Paris. Image by Faqscl, via Wikimedia Commons. 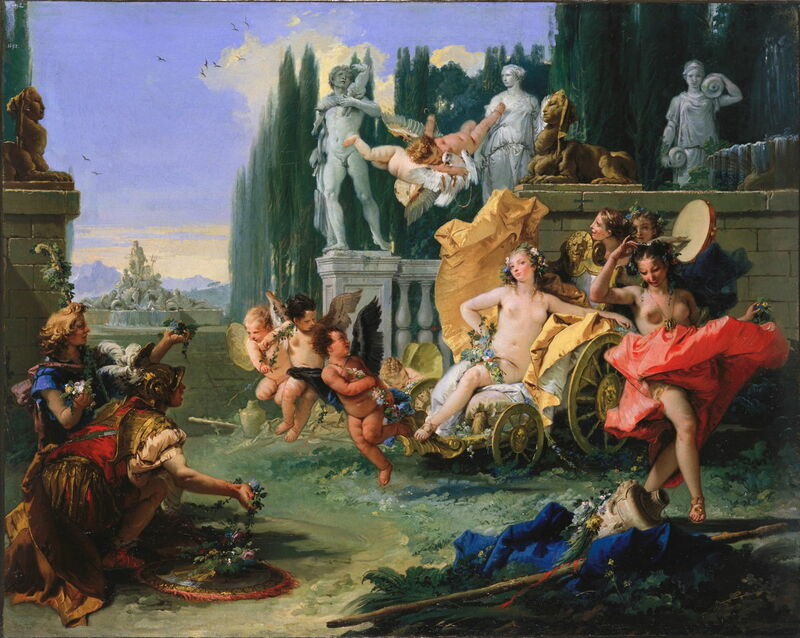 Fifty years later, Antoine-François Callet painted this allegory of Spring (c 1781). There’s no shortage of figures, with Flora at its centre, her breasts bared, and a rather effeminate Zephyrus under her left arm. 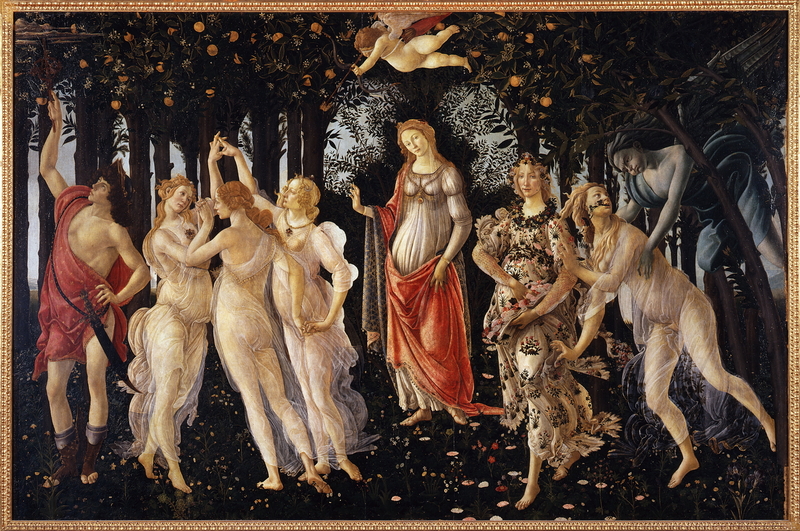 At the lower right are the three Graces, dancing with their hands held high, but at the lower left is the goddess of the harvest Ceres, in her chariot drawn by lions. With her daughter Proserpina, Ceres was often allied with Flora in their common association with plant growth and fertility. 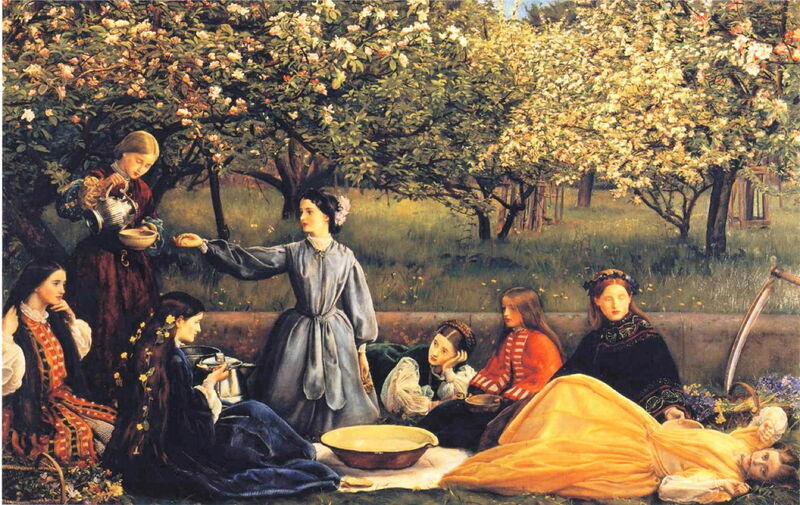 John Everett Millais (1829–1896), Spring (Apple Blossoms) (1856-59), oil on canvas, 110.4 x 172.7 cm, Lady Lever Art Gallery, Liverpool, England. Wikimedia Commons. 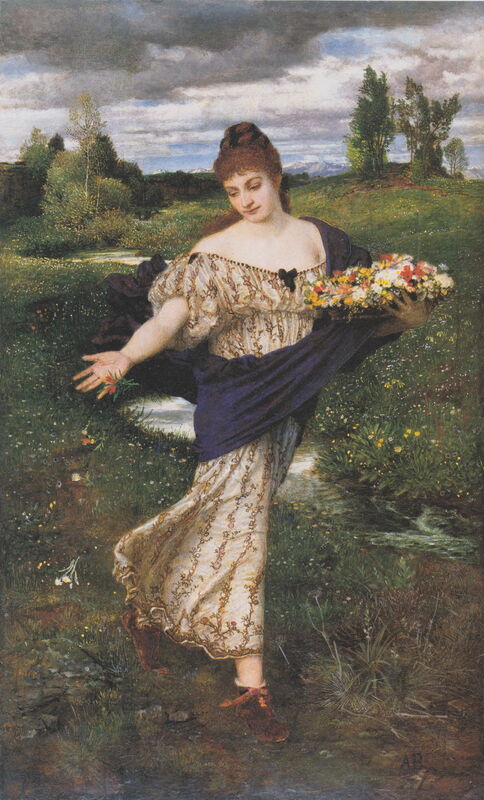 In the late nineteenth century, Flora and her Spring became more popular again in paintings, particularly with artists associated with the Pre-Raphaelite movement. John Everett Millais’ Spring, also known as Apple Blossoms, from 1856-59 may contain subtle allusions to Primavera and classical myth. At the far right, beside this group of elegant young women, is the scythe of Father Time. Two of the group have baskets full of Spring flowers, and three have flowers in their hair. Tempting though it may be to try to see three Graces and Flora herself, I fear that is as far as Millais went. Arnold Böcklin (1827–1901), Flora (1875), oil on panel, 82.5 x 51.5 cm, Museum Folkwang, Essen, Germany. Wikimedia Commons. Others, like Arnold Böcklin, painted simpler non-narrative figures of Flora (1875), scattering Spring flowers. Henrietta Rae (1859–1928), Zephyrus Wooing Flora (1888), further details not known. Wikimedia Commons. Henrietta Rae at least brought the couple together in herZephyrus Wooing Flora from 1888, but in a delicate ‘faerie’ painting quite unlike either Ovid’s or Botticelli’s account. Evelyn De Morgan (1855–1919), Flora (1894), oil on canvas, dimensions not known, The De Morgan Foundation, Compton, Guildford, England. Wikimedia Commons. Evelyn De Morgan’s Flora from 1894 is again a single figure removed from the narrative, although she establishes clearer visual links with Primavera. 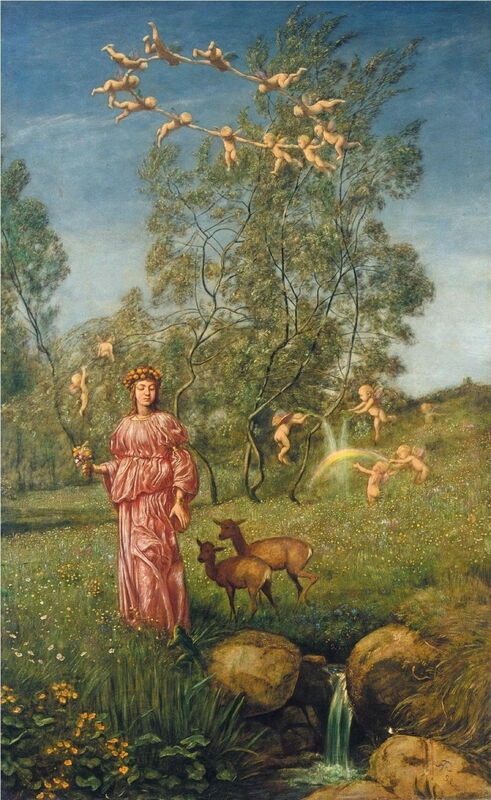 Hans Thoma’s Spring Fairytale, An Allegory from 1898 shows a woman who must surely refer to the figure of Flora in Botticelli’s painting. She is surrounded by meadow flowers, two small fawns, and sundry winged putti. But it’s my last two paintings, both late works by John William Waterhouse, which refer more strongly to Primavera. 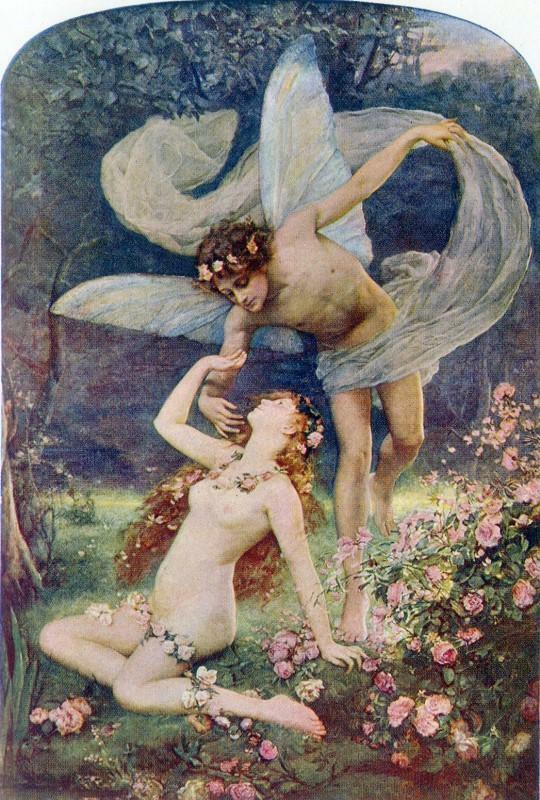 In Flora and the Zephyrs, from 1898, Flora sits, arms raised, to the right of centre as Zephyrus kisses her right arm from above. 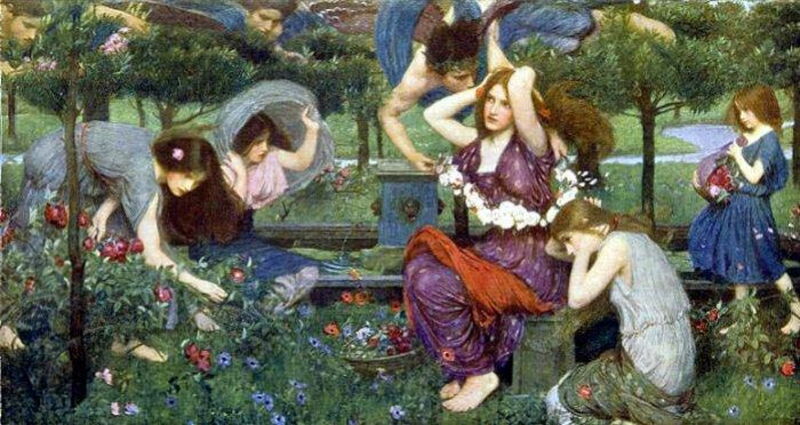 With her are the three Graces (not the Hours with their colourful clothes), who rather than dancing together are gathering the flowers to braid into their hair. Other winds are seen over the treetops. I apologise for the poor quality of this image. John William Waterhouse (1849–1917), A Song of Springtime (1913), oil on canvas, 71.5 x 92.4 cm, Private collection. Wikimedia Commons. 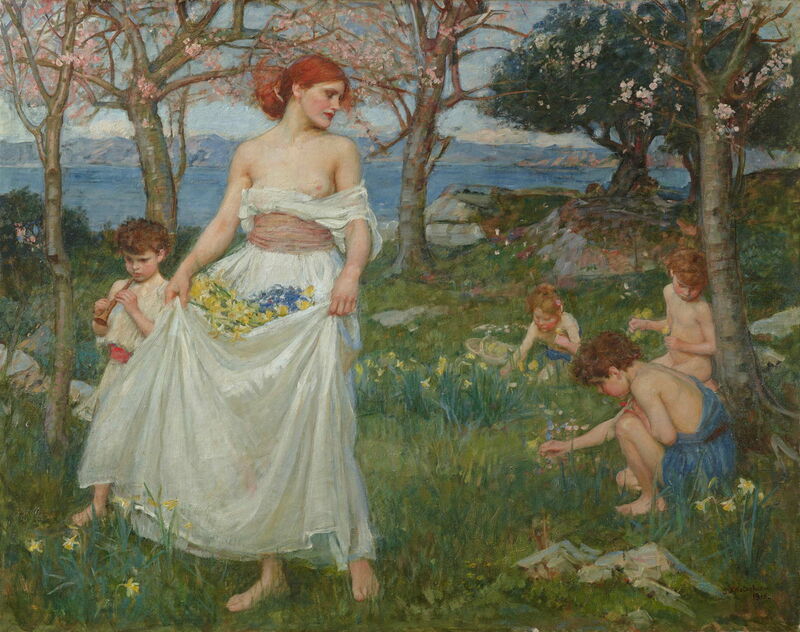 When Waterhouse revisited this theme more than a decade later, in his A Song of Springtime (1913), he sadly stripped away several of its narrative references, but showed Flora with breasts bared, and a skirtful of daffodils or narcissi – perhaps a cross-reference to Poussin and his figure of Narcissus in The Empire of Flora. The Graces have here been replaced by young children. Although the strength of narrative in subsequent paintings of Flora and Spring has fluctuated, it’s a tribute to both Botticelli’s and Poussin’s paintings that 400 and 250 years later, they are still being referenced. And they remain major attractions in the Uffizi and the Gemäldegalerie in Dresden. Who says that narrative paintings are no longer popular? Posted in General, Life, Painting and tagged Böcklin, Botticelli, Callet, De Morgan, Millais, myth, painting, Rae, season, Thoma, Tiepolo, Waterhouse. Bookmark the permalink.